Some day soon you’ll be able to read our review of Red Dead Redemption 2. It will no doubt change how you think about the game—and about life itself. Paste is in the business of shattering illusions and permanently altering perceptions, so that shouldn’t be any surprise. It’s just what we do. Until then, though, let’s take a look at one of our favorite parts of Rockstar’s brand new western epic. Variety calls cowboy movies “oaters,” after the actor Warren Oates, who is a guy you’d recognize today if you watched a lot of cowboy movies. Cowboy movies also usually include horses, which typically eat oats, which are also some kind of foodstuff. (We don’t encourage the use of Variety’s slanguage in everyday life, btw.) 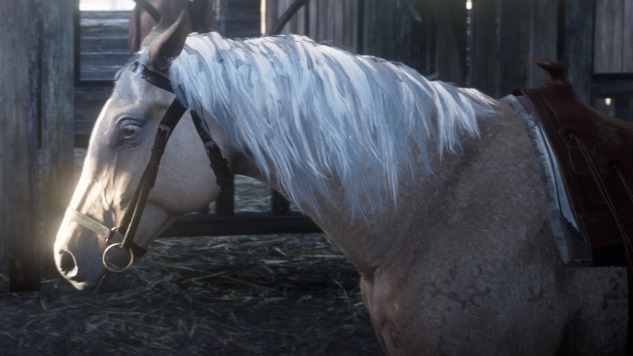 As a cowboy game, Red Dead Redemption 2 understandably has horses of its own. They play a crucial role—not only do they carry your stuff and provide you with a warm neck to pet, they also get you where you need to go. Very slowly. 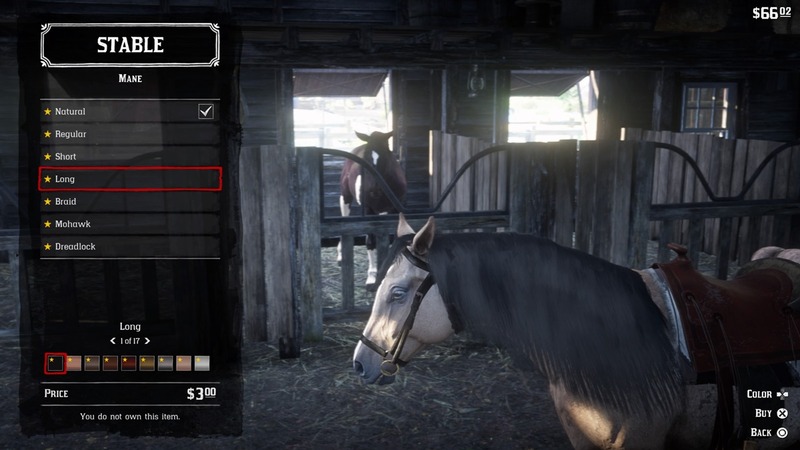 You can buy, sell, steal and tame horses throughout the game, dropping whichever ones you aren’t currently using off at the closest stable. They might get lonesome far away from your bandit camp, surrounded by all those strangers, but there’s still comfort in those stables. They don’t have to worry about getting shot down by O’Driscolls, or mauled by bears, or, um, run headfirst into road signs because you’re just a little bit clumsy at these here videogames every now and again. No stabled horse will have to be mercifully put down by its owner in this game, so even if their lives are bereft of adventure, they can at least rest easy at night. 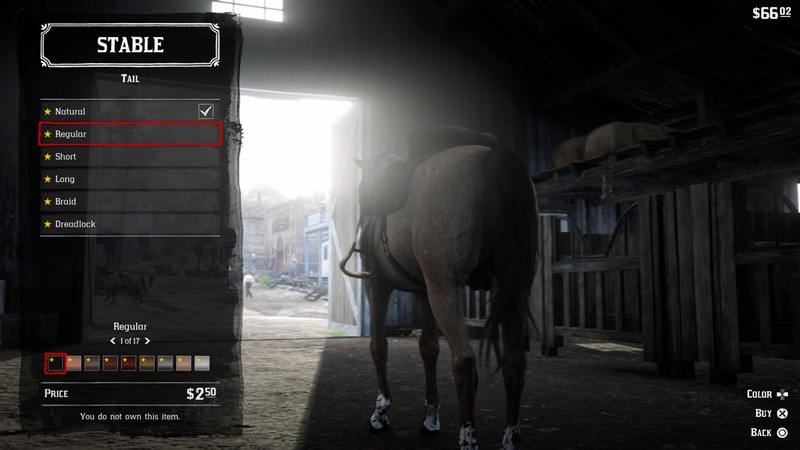 Stables are also where you can stock up on new supplies for your horse. That means tack like saddles and stirrups, but also medicine and cleaning products. You can also pay to get your horse groomed at a stable, and that’s what we’re here to talk about today. 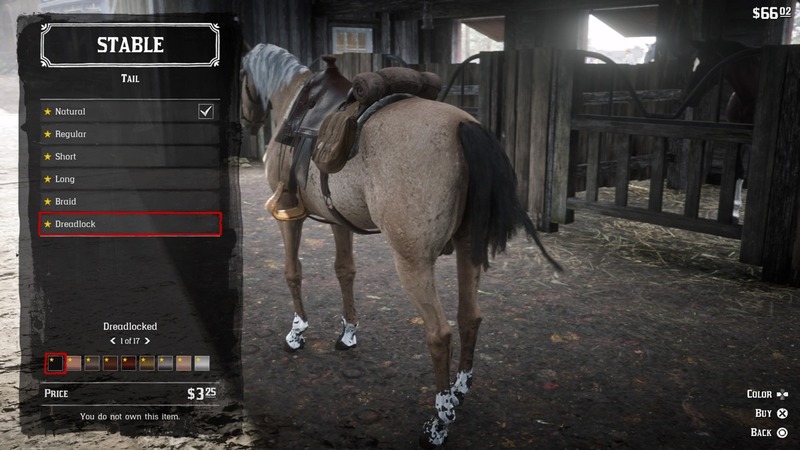 Red Dead Redemption 2 wants your horse to look good. As such it has a variety of hairstyles for your equine friend, both for their manes and their tails. 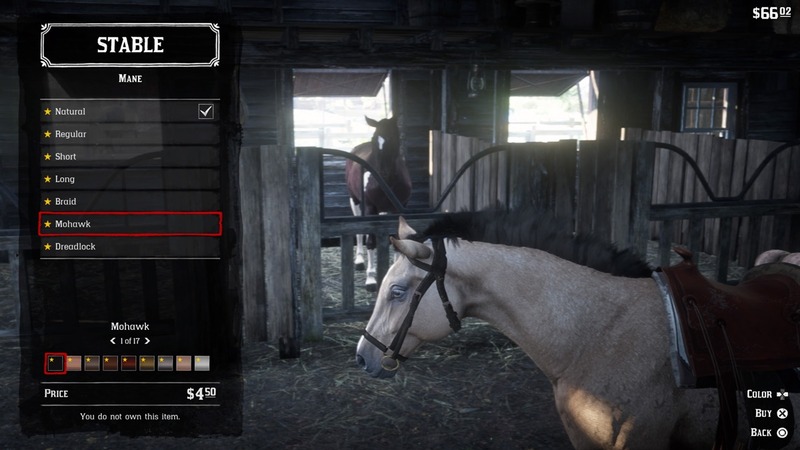 You’ll discover this early on in the game, during a mission designed specifically to introduce you to stables and everything you can do there, and if you’re like us you’ll spend entirely too much time deciding how you want your horse to look. It’s a legitimately tough call, and if you want to get a jump start on it all, check out our gallery of horse hairstyles below. 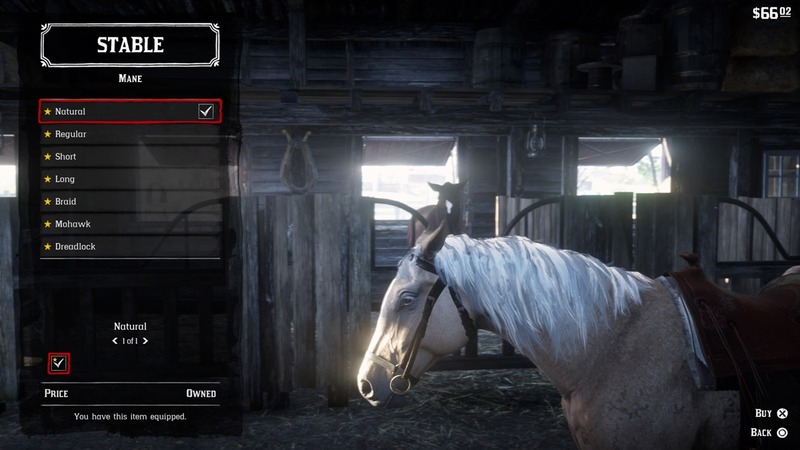 These screenshots come straight from the game, and include every style available the first time you come upon a stable. And if you like what you see, remember that they all come in multiple colors, too. The horse in this photo is one you can buy during that first visit to a stable. Its mane and tail are naturally white, as you can see in the photo above. This is how this horse looks with no alterations—his standard mane in its God-given color. If you choose to style that hair you can pick from a veritable rainbow of colors, although the default on the other styles will be black until you take that initiative. There’s nothing too exciting here. If you were forced to draw a horse’s mane from memory, you’d probably be able to sketch something like this down without any difficulty. Still, there’s a quiet grace in embracing the expected, and nobody should ever judge a horse with the classic horse’s mane. It’s tough losing your hair. We know that. And we know that hanging out with other people who are struggling with baldness can make you feel better about the changes you’re undergoing. That might not be a good reason to make your horse look like he has alopecia, though. 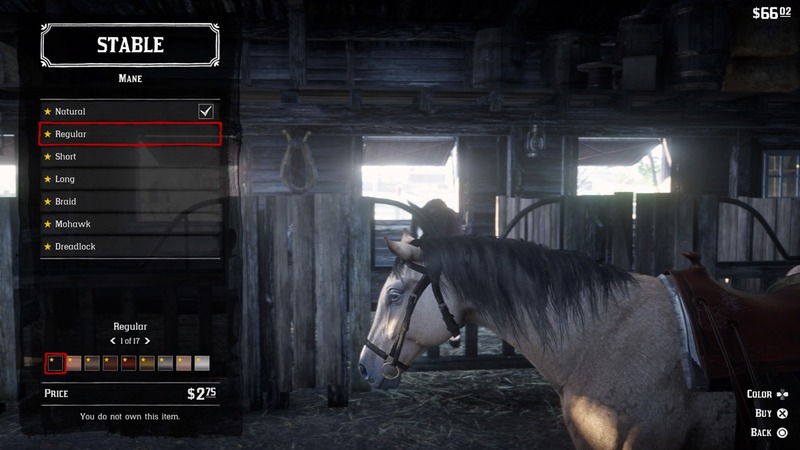 Maybe you don’t want that wild, untamed mane rippling majestically into your character’s face as you gallop through the wild countryside, but you have to think about your horse’s needs and not just your own. You can go with the short cut if you want, but that’s not fair to your closest friend and partner, who would never willingly cut its own hair. Mostly because horses can’t use scissors, but still. What a gorgeous head of hair on this horse! This is a power move, pure and simple, an easy way to shame all other horses—and humans—into acknowledging your horse’s superiority. If you want a horse that looks ready to play the Whisky a Go Go in 1987, this is the ‘do for you. Time seems endless in the hills of the wild west. There are only so many hours a day you can spend drinking, robbing and carousing. Sometimes you have to while away the hours by gingerly weaving the strands of your horse’s hair together, creating a glorious striated waterfall of nasty, disgusting horse hair. What else can you do? 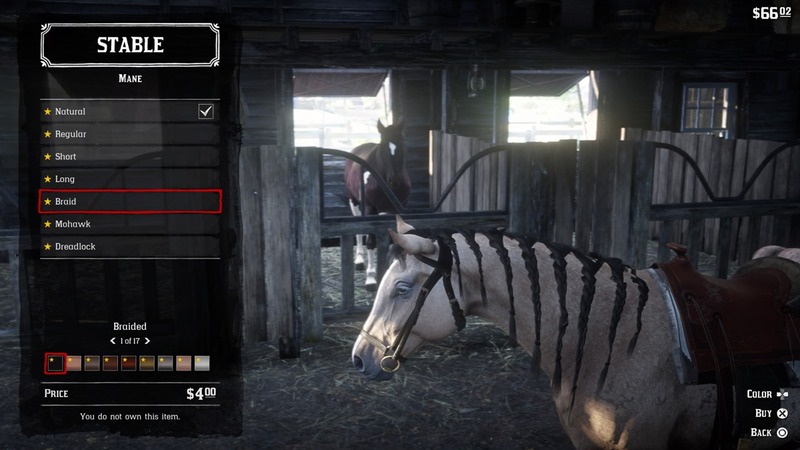 What a waste of money, paying some guy at a stable to give your horse dreadlocks like this. A true man of the horse knows that if you just do nothing long enough your loyal steed will inevitably look like the guy in your freshman dorm who dropped out to focus on hacky sack. Again, this is just what any given horse’s tail looks like before you start messing around with it. The styles for horsetails pretty much follow along with the ones for the manes, although it’s missing the Mohawk, for some reason. Maybe that would just look undignified on a rear end, but then most people we’ve know with Mohawks have been real horse’s asses, so who knows. There’s not a lot to say about this one. It’s just about as regular as can be. It’s black (or maybe dark brown), it’s hanging on the back of a horse, it’s a total regular ol’ horsetail. At least it knows what it’s supposed to do. For hygiene purposes it just makes sense to keep that tail short. Not just because of the major bodily function that just happens to occur right beneath that tail multiple times a day (and which the game relishes showing in crisp detail at unexpected intervals), but on account of all that dirt that gets kicked up on the trail. The shorter the tail, the less likely it’ll naturally turn into dreadlocks, which we’ve already established is a hairstyle people apparently pay for their horses to have in this slice of the frontier. 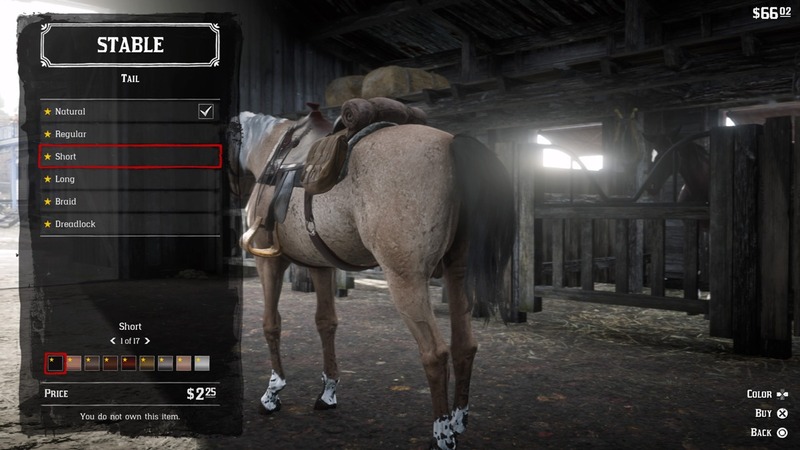 We just explained why it’s smart to keep your horse’s tail short out on the trail, game. Dammit. Well, if you want it to flow long and free, dangling languidly in the warm prairie breeze, you can go right ahead and do so. You’re the one who’ll have to comb that nasty thing, so whatever. 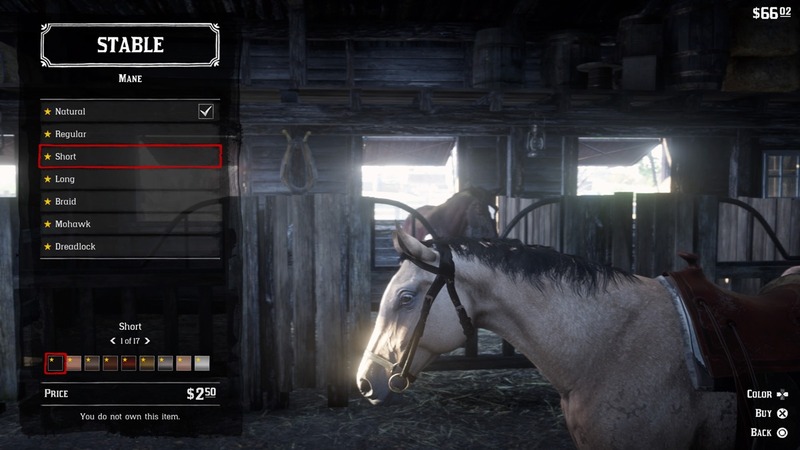 When all is said and done the braided horsetail is going to be the iconic image not just of Red Dead Redemption 2 or the Red Dead series but of Rockstar’s entire catalogue. That’s a strong, proud tail, one that can hurt somebody, but only when they really deserve it. That’s a tail perfect for tying up O’Driscolls or tying down game. If your cowboy is unlucky enough to take a spill over a perilous cliff, and is just barely struggling to hang on with ten aching fingers screaming to let go and embrace oblivion’s sweet release, this is a tail that could easily let you haul yourself back into having a future, assuming your horse knows to dangle it over the precipice just so. Wait, are those supposed to be dreadlocks? Or is this unscrupulous stable master and horse stylist taking advantage of the fact that horses can’t really see their own tails? It definitely looks like somebody’s trying to pull a fast one on that poor trusting horse, promising an egregiously terrible (and culture appropriating) hairstyle and then delivering whatever… that is supposed to be. This would be about the time we introduced this no count horse-fooling bunco artist to the business end of our sawed-off 12 gauge, we tell you what.